Welcome to Radley Electric, Inc.
From the small seedling planted by our founder Ernest Radley in 1945, his commitment to Christian values, his vision, struggles and his hard work, our family business has flourished. Our goal is to give the best 24-hour oil, commercial and industrial services to Southeast Texas and its surrounding areas. Radley Electric, Inc. is dedicated to providing a safe, stable and professional work environment for our employees. Radley Electric is a community service oriented company, and our employees are encouraged to be an active part in the improvement of Sour Lake. Our most recent project was a company-led clean up of the century-old Mowbray cemetery. 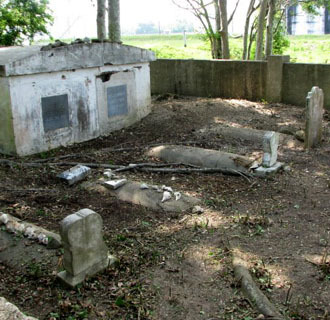 The Mowbray family burial ground contains six graves and is completely surrounded by a four-foot tall concrete wall with no entrance. The site is behind a locked gate and the only living Mowbray family member lives in Mississippi. We were granted permission by a local oil company to clean and restore this historical landmark of our city. This project and others are a part of REI’s efforts to beautify, restore and preserve our town's history. Radley Electric is a member of Sour Lake’s Chamber of Commerce and contributes regularly to Sour Lake Volunteer Fire Department and EMS, Hardin-Jefferson Independent School District, Old Timers Day, and Twin County Youth Baseball. All Rights Reserved, © 2011. Radley Electric, Inc. Site design & maintenance by Anna Radley.